Scott Walker drops out of 2016 race, urges other Republicans to do the same. Wisconsin Gov. Scott Walker speaks at a news conference September 21, 2015 in Madison. Scott Walker called it quits on Monday, announcing at a brief press conference that he has suspended his presidential campaign. On his way out, though, the Wisconsin governor had some final words of advice for a few of the other 15 Republicans still in the race: You should get out, too—for the good of the party. “Today, I believe that I am being called to lead by helping to clear the field in this race so that a positive conservative message can rise to the top of the field,” Walker said, later adding: “I encourage other Republican presidential candidates to consider doing the same so the voters can focus on a limited number of candidates who can offer a positive conservative alternative to the current front-runner.” While Walker never mentioned Donald Trump by name, it was clear the blustery billionaire was the target of his comments. In many ways, it’s fitting that Walker headed for the exit with a shot at Trump. While the Donald wasn’t the only reason for Walker’s rapid fall from a front-runner to an after-thought, the real estate tycoon certainly played a bigger role than most. Walker failed to make much noise at either of the Trump-dominated Republican debates this year and struggled to give coherent answers to Trump-prompted questions on the campaign trail (see: Citizenship, Birthright). Walker was running neck-and-neck-and-neck with Bush and Marco Rubio atop national polls prior to Trump’s unexpected entry into the field in June; three Trump-filled months later, Walker had become a rounding error. 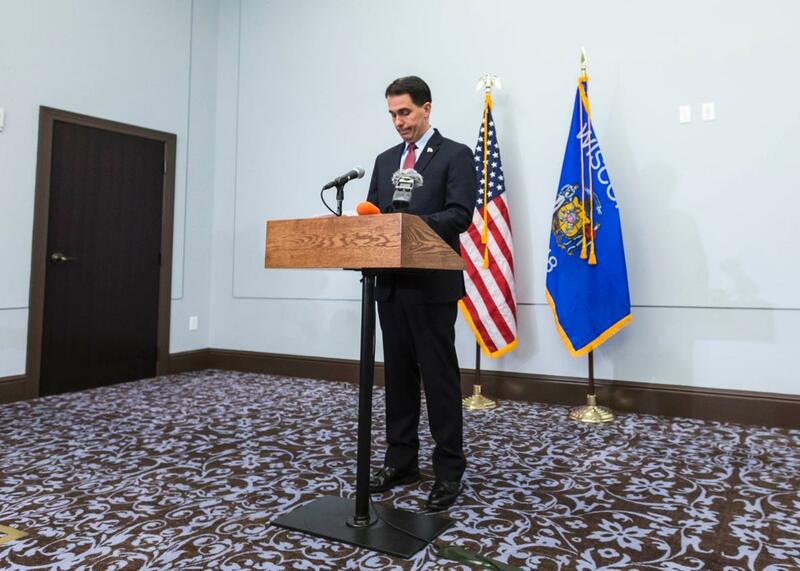 In the short term, Walker’s departure won’t drastically change the GOP race. With only a fraction of one-percent support in the most recent national poll, his fans could migrate en mass to another candidate without altering the current standings. In the longer term, though, his departure could be a significant turning point. For starters, his donor base is now up for grabs—the biggest prize is probably Chicago Cubs co-owner Joe Ricketts, who along with Wisconsin roofing magnate Diane Hendricks accounted for half of the $20 million Walker’s super PAC raised this past quarter. * Walker’s exit also means the unofficial Koch Bros. primary field is down to four candidates: Bush, Rubio, Carly Fiorina, and Ted Cruz, all of whom joined Walker at the last Koch donor confab earlier this summer. More importantly, Walker’s unexpected exit could convince Republican Party powerbrokers that it’s time to circle the wagons and rally around a single candidate in hopes of stripping Trump of his front-runner status. That’s good news for the likes of Bush, Rubio, and John Kasich. Now all they have to do is survive long enough for that to happen. *Correction, Sept. 21: This post originally mispelled Joe Ricketts’ last name.